Tamil Nadu government has announced a Scheme for the protection of exotic Neelakurinji (Strobilanthus kunthianus) plants that flower only once in 12 years. This scheme comes following complaints that these rare and ecologically unique flowers are being packaged and sold on the commercial basis. It is native to the Shola forests in Western Ghats. 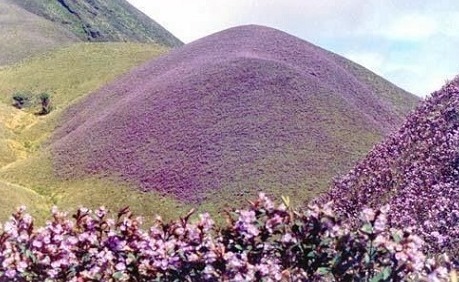 It grows at an height of 30 to 60 cm on hills slopes at an altitude of 1300 to 2400 meters where there is no tree forest. It is because of these flowers, Nilgiri hills on the southern tip of Western Ghats are called blue mountains. It is a rarest of rare plant species that grows in Western Ghats and does not grow in any other part of the world. It has been categorized as an endangered species. Paliyan tribal people living in Tamil Nadu use this flower bloom as a reference to calculate their age. Q. Tamil Nadu government has announced a Scheme for the protection of which exotic plants that flower only once in 12 years?